Ben Kennedy, age 26 is the son of Lesa France Kennedy. That makes him the great-grandson of NASCAR founder Bill France Sr.
Kennedy has racing in his blood. He began his stock car racing career Super Late Models. He picked up the championship at Orlando Speedworld. In 2011, he moved up to full-time competition in the NASCAR K&N Pro Series. 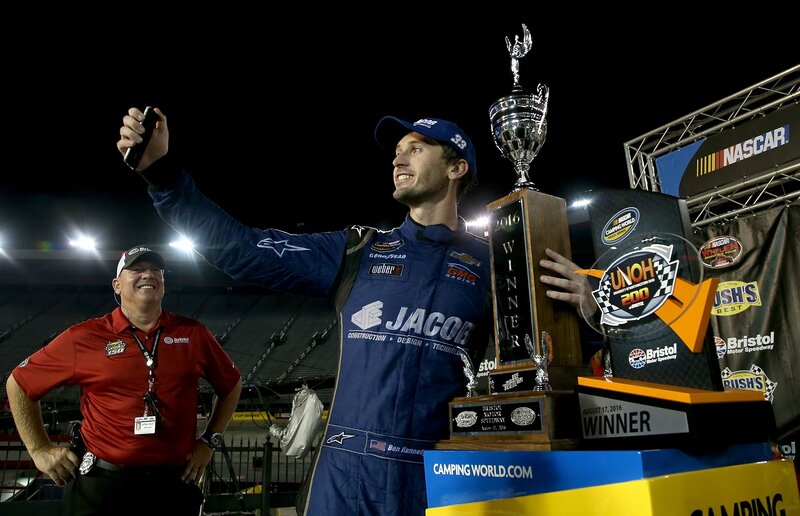 In 2012, he ran the first oval race hosted by the NASCAR Euro Series, Kennedy went to victory lane. In 2013, Kennedy made his NASCAR Truck Series debut with a 20th place run at Bristol Motor Speedway. From 2014-2016, the driver ran full-time in the NCWTS. In addition, he ran part-time in the NASCAR Xfinity Series. He collected 72 starts in the NCWTS throughout his racing career. Of those, he picked up a win at Bristol Motor Speedway in 2016. His best Xfinity finish was a 4th place run at Talladega Superspeedway in 2017. For 2018, Kennedy has removed the helmet, gloves and fire protection layers. In it’s place, Kennedy has a new suit though sometimes it’s just a button down. He’s taken a new role as General Manager of the NASCAR Camping World Truck Series. With that position came the requirement to hang up his racing career. Recently, the NASCAR CEO has indefinitely stepped away from the sport. Brian France was arrested after rolling through a stop sign in his 2017 Lexus. His blood alcohol content was recorded at 1.9, twice the legal limit. In addition, Police search his person and discovered five T 194 pills in his procession. The yellow pills were Acetaminophen and Oxycodone Hydrochloride. Since the arrest, Brian France has stepped down. In his place, Brian’s uncle, Jim France has stepped back into the position of NASCAR CEO. The NASCAR CEO has been critiqued in years past. What if the position could be filled by a racer? What if the NASCAR CEO was a former NASCAR driver who understood exactly what the sport is, what it could be and how the cars work. Does Ben Kennedy have interest in working toward that position? “Possibly,” Kennedy told Dave Moody via Sirius XM NASCAR Radio. “I’m just focused on the here and now in the Truck Series and what we can do with that and some of our other initiatives.